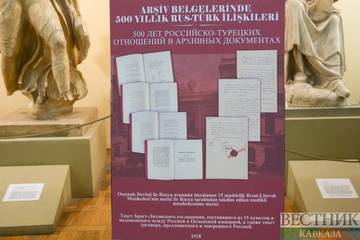 The exhibition is organized by the Turkish State Archives Department, the Institute of Oriental Studies of the Russian Academy of Sciences, the Russian-Turkish educational and scientific center of the RSUH and the Yunus Emre Institute in Moscow. The exhibition was opened by Turkish Ambassador to Russia Huseyin Dirioz, head of the Oriental History Department at the Institute of Oriental Studies of the Russian Academy of Sciences Dmitri Vasilyev and General Director of State Archives of Turkey Ugur Unal, vice-rector of the Russian State University for Humanities Olga Pavlenko. 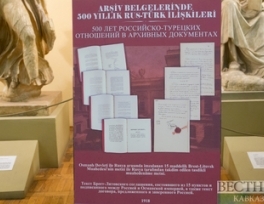 Dmitri Vasilyev, speaking with the correspondent of Vestnik Kavkaza, said that the organization of such exhibitions is a traditional form of scientific work of the Russian-Turkish educational and scientific center. “Not so long ago we held a magnificent exhibition dedicated to the architectural and applied heritage of the Seljuk state. It was a great success. Now we have the honor to present an exhibition of unique documents of the 16th-20th centuries from the large Ottoman archive of the Turkish Republic. Documents are stored there as one of the greatest treasures of the republic, the earliest among them are letters from the correspondence of Ivan IV," he said. "We timed the exhibition to the 200th anniversary of the Institute of Oriental Studies; it is held as part of the anniversary events that have been started yesterday at the World Trade Center. Thematic conferences will start tomorrow in philology, history, economics, political science, ethnography, and archeology. The Institute of Oriental Studies is a unique institution, because its specialists have the opportunity to share knowledge in various areas. This enriches the results of their activities and allows them to do interesting and unexpected discovery," Dmitry Vasiliev stressed. At the opening of the exhibition, Ambassador Huseyin Dirioz thanked the organizers for making this event possible. "During his visit to Moscow on August 24, 2018, Turkish Foreign Minister Mevlüt Cavusoglu, speaking at a joint press conference with Mr. Lavrov, called Russia a strategic partner of Turkey. He noted that the cooperation takes place in various fields: energy, agriculture, tourism, trade, defense industry and others. Last weekend, our leaders met in Istanbul, and it was the 15th time since I took up my duties in Moscow. Today’s exhibition of archival documents, which covers the 500-year history of relations between Turkey and Russia, once again sheds light on the strong historical and cultural ties between our countries. The fact that such distinguished guests are present at the opening of the exhibition testifies respect for our common history," Huseyin Dirioz noted.